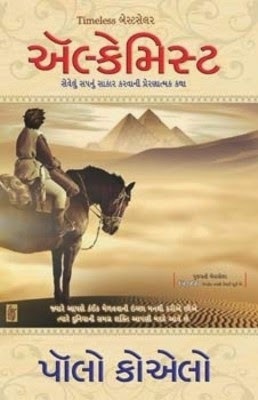 Originally written in Portuguese by Paulo Coelho, The Alchemist (Gujarati) is an international best-selling novel about a shepherd who travels to Egypt in search of treasure, after deciding to heed the images and words of his recurring dream. It runs along the theme that when a person wishes for something deeply, the universe conspires to help him/her achieve it. The Alchemist (Gujarati) revolves around the shepherd called Santiago and his journey. Santiago has a constantly recurring dream that bothers him. He meets a gypsy, who interprets it for him, asking him to go in search for the treasure, which lies in the pyramids of Egypt. On his journey to Egypt, Santiago meets Melchizedek, an old king, who teaches him the concept of a Personal Legend, which is something a person always wished to achieve. Later, Santiago sells his sheep to continue on his journey to Egypt. He travels through the Sahara desert with an Englishman, and meets Fatima, an Arabian woman he falls in love with. He expresses his desire to marry her, but moves on towards Egypt, as she agrees to marry him only after he is able to find his treasure. The Alchemist (Gujarati) speaks about true love being that which doesn’t stop one from achieving what one always wanted to. Furthermore, Santiago comes across an alchemist who teaches him more about the Personal Legend and states that the treasure in store is of more worth than gold itself. 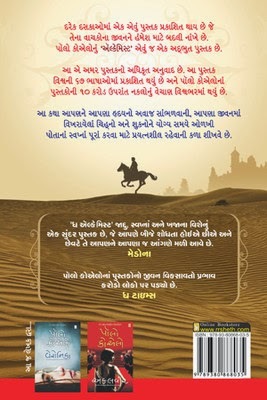 Written by Paulo Coelho, The Alchemist (Gujarati) is mostly based on the theme that one should not abandon his/her dreams and always be in the pursuit of fulfilling one’s destiny. This is an allegorical novel and is about listening to one’s heart, learning to read the omens scattered along the path of life and following one’s dreams. This book is an international bestseller. It was originally written in Portuguese and has been translated into 56 languages, and has sold more than 30 million copies across the world. The book set a Guinness World Record for being the book that has been translated the most for a living author. Paulo Coelho is a well known novelist and lyricist. His books are amongst the widely read today. He worked as an actor, theatre director and journalist before turning into a writer. Some of his other books are The Pilgrimage, Brida, The Winner Stands Alone, Love Letters from a Prophet, By the River Piedra I Sat Down and Wept, Eleven Minutes and Aleph. Most of his writings are based on drama, psychology and self-improvement. Born on 24th August, 1947, in Rio de Janeiro, Brazil, Paulo Coelho has received many awards and recognitions for his works. He is married to Christina Oiticica, and they divide their time traveling between Rio de Janeiro and Europe. He also writes three blog posts every week. Publisher: R. R. Sheth & Co.